Definition at line 45 of file llmoveview.h. Definition at line 72 of file llmoveview.cpp. References LLUICtrlFactory::buildFloater(), LLPanel::childSetAction(), LLUICtrlFactory::getButtonByName(), LLViewerUICtrlFactory::getJoystickAgentSlideByName(), LLViewerUICtrlFactory::getJoystickAgentTurnByName(), gUICtrlFactory, mBackwardButton, mFlyButton, mForwardButton, mMoveDownButton, mMoveUpButton, MOVE_BUTTON_DELAY, moveDown(), moveUp(), mSlideLeftButton, mSlideRightButton, mTurnLeftButton, mTurnRightButton, NULL, onFlyButtonClicked(), LLButton::setHeldDownCallback(), LLButton::setHeldDownDelay(), LLFloater::setIsChrome(), sInstance, TRUE, turnLeft(), and turnRight(). 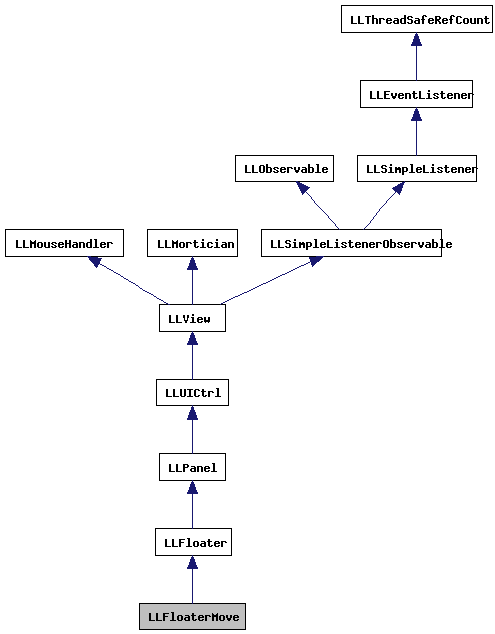 Definition at line 116 of file llmoveview.cpp. Definition at line 62 of file llmoveview.h. Definition at line 180 of file llmoveview.cpp. Referenced by agent_turn_left(), agent_turn_right(), LLJoystickAgentTurn::onHeldDown(), turnLeft(), and turnRight(). Definition at line 215 of file llmoveview.cpp. Definition at line 208 of file llmoveview.cpp. Definition at line 123 of file llmoveview.cpp. References FALSE, gSavedSettings, LLFloater::onClose(), and LLControlGroup::setBOOL(). Definition at line 173 of file llmoveview.cpp. Definition at line 138 of file llmoveview.cpp. References f, gSavedSettings, LLFloaterMove(), LLFloater::open(), LLControlGroup::setBOOL(), sInstance, and TRUE. Referenced by LLShowFloater::handleEvent(), LLViewerWindow::initWorldUI(), and toggle(). Definition at line 154 of file llmoveview.cpp. References LLFloater::close(), NULL, show(), and sInstance. Definition at line 194 of file llmoveview.cpp. References gAgent, LLButton::getHeldDownTime(), getYawRate(), LLAgent::moveYaw(), mTurnLeftButton, and sInstance. Definition at line 201 of file llmoveview.cpp. References gAgent, LLButton::getHeldDownTime(), getYawRate(), LLAgent::moveYaw(), mTurnRightButton, and sInstance. Definition at line 167 of file llmoveview.cpp. Definition at line 78 of file llmoveview.h. Referenced by LLFloaterMove(), and LLAgent::propagate(). Definition at line 75 of file llmoveview.h. Definition at line 77 of file llmoveview.h. Definition at line 84 of file llmoveview.h. Definition at line 83 of file llmoveview.h. Definition at line 79 of file llmoveview.h. Definition at line 80 of file llmoveview.h. Definition at line 81 of file llmoveview.h. Referenced by LLFloaterMove(), LLAgent::propagate(), and turnLeft(). Definition at line 82 of file llmoveview.h. Referenced by LLFloaterMove(), LLAgent::propagate(), and turnRight(). Definition at line 87 of file llmoveview.h. 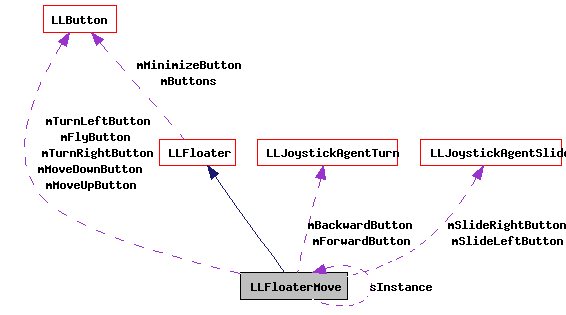 Referenced by getInstance(), LLFloaterMove(), show(), toggle(), turnLeft(), turnRight(), visible(), and ~LLFloaterMove().